Cathy N. Davidson. 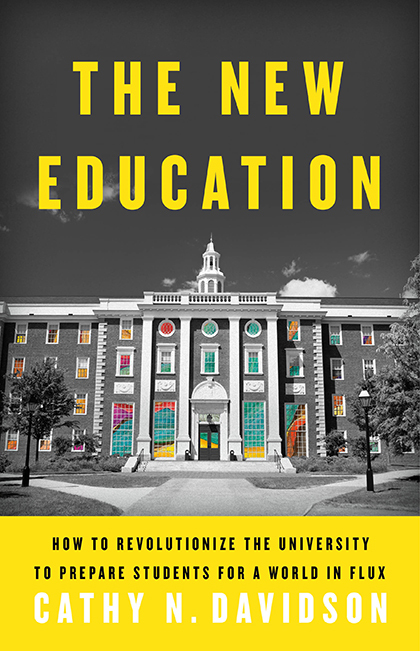 The New Education: How to Revolutionize the University to Prepare Students for a World in Flux. New York: Basic Books, 2017. 336 pp. Cathy Davidson’s The New Education is a visionary book—shadowed (“haunted” would be too melodramatic) by a dour, even desperate book. The happy book is a story of inventive, iconoclastic professors (like Davidson herself) working at institutions ranging from Stanford University to LaGuardia Community College, from Arizona State to Georgetown, devising radically interdisciplinary courses and curricula that put information technology, collaboration, and crowdsourcing to intellectually stimulating and socially productive ends. The unhappy book is a story of adjunct faculty with no secure institutional home, earning wages below the poverty line. The happy book is replete with dynamic, resourceful students who readily take up the challenge to confront their institution’s legacy of slavery or invent interactive video games for people in assisted living facilities; the unhappy book is filled with students who know their lives will be torqued by the massive debts they have incurred in the course of their education, debts ranging from the tens to the hundreds of thousands of dollars. The unhappy book, you will have guessed, is animated by the Spirit of American Higher Education Present; the happy one is infused with a Spirit of American Higher Education Future—the best of many possible futures, and one that will come about only if Davidson, her Futures Initiative at CUNY, and her passel of like-minded colleagues from coast to coast manage to carry the day. Should that happen, the difference between our present and past will be so stark as to be the stuff of speculative fiction. For Davidson asks us to rethink absolutely everything about the university we have inherited from the late nineteenth century, starting with admissions, moving to grades, departments, and majors, and extending even to state funding, student loans, and the trajectories of faculty careers. Davidson has been fighting a two-front battle for some years now, against technophobes and glassy-eyed MOOC (massive open online course) enthusiasts alike; indeed, the chapter “Against Technophobia” is followed by “Against Technophilia.” As if that were not enough, she has had to insist time and again on the intelligence and independence of students: in Now You See It (2011), her foil was Mark Bauerlein’s lament about “the dumbest generation”; this time it’s William Deresciewicz’s dismissal of students as “excellent sheep.” As a result, it sometimes seems here that student crowdsourcing always works, and students are always ingenious and public-spirited. No students here are tuning out the lecture by watching sports highlights or texting friends, partly because no professor here is lecturing in the first place. I can imagine that some readers of this journal might be put off by the “crossover” rhetorical mode of this book (Randy Bass, we learn, dresses casually but fashionably, and Ann Pendleton-Jullian really knows how to wear a scarf) or by the number of times Davidson draws the parallel between her book and Charles Eliot’s agenda-setting 1869 Atlantic essay, coincidentally titled “The New Education” (spoiler alert: many). But I’m not in the mood for such quibbles over taste, nor do I expect to be anytime soon. Cathy Davidson’s vision of the university to come is so vastly preferable to the one we now inhabit that I wouldn’t care if the entire text adopted the format of the TED talk, along with origami popups. It is a vision that combines the best features of the community college and the elite research university—in which students are mentored, engaged, and intellectually stimulated from the moment they arrive on campus; in which faculty are full-time, tenure-track professionals encouraged to innovate and never held to reductive metrics like “impact” or “outcomes”; in which public universities enjoy all the political and financial support they need to fulfill the mission of creating an educated (and very employable) citizenry in a democratic society. It is a vision of a world without oppressive student debt and without an impoverished academic precariat, a vision of campuses where everybody is actually interested in learning and willing to contribute to the project of redefining what “learning” is. Is it chimerical? Very likely. But it is a vision worth believing in.